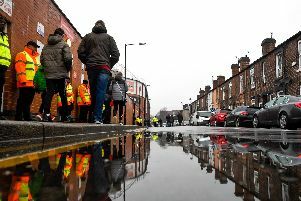 A police probe into a fatal stabbing in Sheffield is continuing, with forensic work and CCTV examination still under way. Jarvin Blake, aged 22, was knifed to death at the junction of Catherine Street and Brackley Street, Burngreave, on Thursday, March 8 in what detectives are treating as a targeted attack. A group of men jumped out of a car and chased Javin, who was a dad-of-three, before stabbing him in his chest. Jarvin, from Gleadless, was rushed to hospital but could not be saved. A 23-year-old friend he was with at the time of the knife attack was also stabbed but survived. Four men arrested over the murder have been released while enquiries continue. A South Yorkshire Police spokesman said: "At this time the investigation is progressing with four suspects remaining on police bail. "Forensic examinations are still being undertaken, along with extensive CCTV viewing and the analysis of mobile phone data."